“There is one form of sport in which I have, I think, been able to do some practical good, for I can claim to have been the first to introduce skis into the Grisons division of Switzerland, or at least to demonstrate their practical utility as a means of getting across in winter from one valley to another. It was in 1894 that I read Nansen’s account of his crossing of Greenland, and thus became interested in the subject of ski-ing. It chanced that I was compelled to spend that winter in the Davos valley, and I spoke about the matter to Tobias Branger, a sporting tradesman in the village, who in turn interested his brother. We sent for skis from Norway, and for some weeks afforded innocent amusement to a large number of people who watched our awkward movements and complex tumbles. The Brangers made much better progress than I. At the end of a month or so we felt that we were getting more expert, and determined to climb the Jacobshorn, a considerable hill just opposite the Davos Hotel. We had to carry our unwieldy skis upon our backs until we had passed the fir trees which line its slopes, but once in the open we made splendid progress, and had the satisfaction of seeing the flags in the village dipped in our honour when we reached the summit. But it was only in returning that we got the full flavour of ski-ing. In ascending you shuffle up by long zigzags, the only advantage of your footgear being that it is carrying you over snow which would engulf you without it. But coming back you simply turn your long toes and let yourself go, gliding delightfully over the gentle slopes, flying down the steeper ones, taking an occasional cropper, but getting as near to flying as any earth-bound man can. In that glorious air it is a delightful experience. It was an interesting early example of back-country skiing, and I must admit that I have not attempted to make the journey from Davos to Arosa, by skis. One to add to the list. 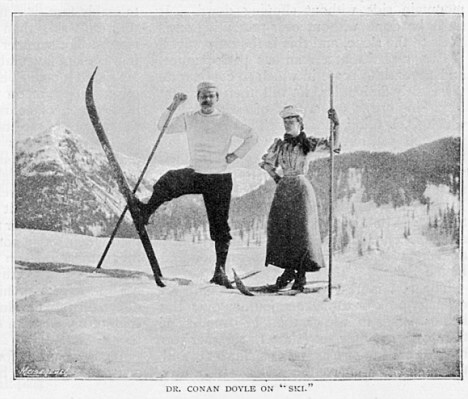 Conan Doyle wrote prolifically, and no doubt engendered interest in the English public (or at least a section of it) through his enthusiastic reports on “ski-running”, as he often called it. In an article in the Strand Magazine in 1894 he opined “Ski-ing opens up a field of sport which is, I think unique. I am convicted that the time will come when hundreds of Englishmen will come to Switzerland for the ski-ing season in March and April”. He described the sport as one where “You have to shuffle along the level, to zigzag, or move crab fashion, up the hills, to slide down without losing your balance, and above all to turn with facility.” Whenever I ski the Jakobshorn, I can’t help but think of Conan Doyle energetically moving crab fashion in his tweeds and eight-foot long skis, “occasionally taking a cropper”. 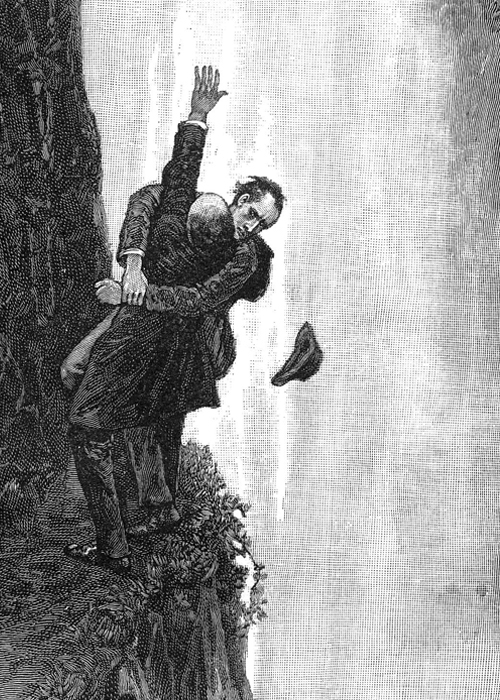 However Conan Doyle’s most famous association with Switzerland is entirely fictional. 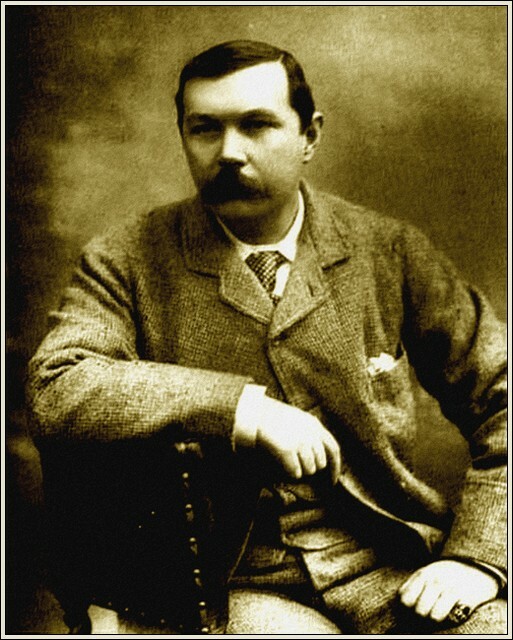 According to his memoirs Conan Doyle also lived in Maloja in Graubünden for a time and in Caux, above Lake Geneva, reached by funicular railway from Montreux. Adding to everyone’s favourite (well, my favourite) winter sports blog, www.alpinewinterblog.com aka www.oatridge.co.uk/nic/, comes a facebook page and, hopefully, via RSSGraffiti, also comes regular updates from the blog on facebook. 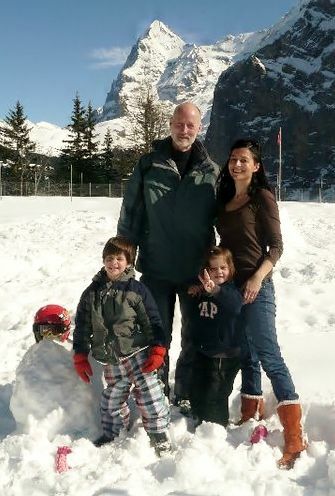 The blog is now in its sixth year and contains dozens of snippets about winter sports, mostly focusing on Switzerland. I have been a keen skier for many years, and when I moved to Switzerland it seemed a dream come true to have all these resorts on my doorstep. There was a little matter of Mrs Oatridge being pregnant, a couple of teenagers to help assimilate and a toddler to look after, so it took a while before I got to go to the slopes. But one fine day I got in the car and headed off in the direction of the distant peaks with a vague notion I would hit a place called Engelberg. Anyway, I took a wrong turn and after driving aimlessly around ended up at a resort called Meiringen. I have been to both many times since (and rarely by car), but the ins and outs of where to go, how to get there and where to stay – either with the family, alone of with friends – led me to start recording what I had learnt, and then came the blog, and then the web sites. 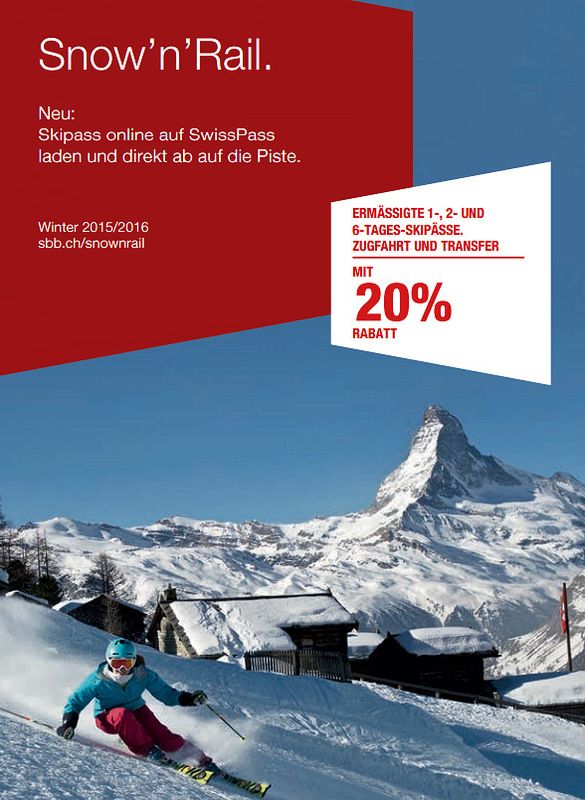 Currently there are two related web sites in addition to this blog: www.swisswintersports.co.uk and www.snowandrail.com. There is also a Dutch language version of the principal web site at www.swisswintersports.nl and what I hope to make into a multi-language portal at www.swisswintersports.com. I don’t have a goal in mind other than to maintain the currency of the current sites and continue to make them the best sites of their type on the Internet, but I also hope to expand the scope, redesign to make them as mobile-friendly as possible and even make some income… oh, yes, and do plenty of research!